Today I’ve teamed up with JORD to give you some tips on how to create the perfect arm candy. I fell in love with JORD watches since the moment I was scrolling through their website because their watches are different than anything I’ve seen. How are they different you may ask? Well simply because their watches are made out of WOOD!!! Yup that’s right wood! They have several collections for both men and women which are made of different types of wood like maple, bamboo, and rosewood to name a few. They also size the watch for you, and ship it in the cutest wooden box. Tip # 1: Start with a statement piece! Watches are my absolute go-to for using as my main piece. There's something about adding a timepiece to your arm candy that gives it a chic look. I am loving my rose gold & maple watch from JORD's Sidney collection. It is elegant and it goes with so many outfits. Tip #2: Pick a color scheme and stick to it. I went with rose as my color scheme to accentuate the rose gold my watch already has. JORD also has a variety of different colored woods and vibrant display colors like violet and turquoise. I love how yellow gold pairs with rose gold so I threw in a yellow gold bracelet in there and I love the way it turned out. Tip #3:Choose diverse pieces to surround it. Choose at least 3-4 layering pieces. Dainty bracelets, and diamond encrusted bracelets are most practical for me because I'm mostly in dressy clothes but if your style is more casual, I recommend beaded, and wrap bracelets. Keep in mind that shape and size matters, so wear both big and small bracelets to add texture to your arm candy. Tip #4: It's called arm candy for a reason. The statement is on your wrist so keep it there. 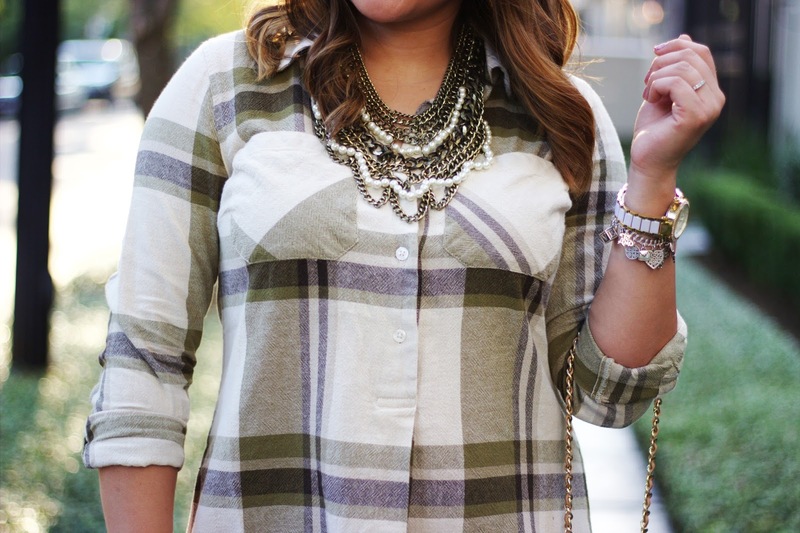 Don't go crazy adding a statement necklace and big earrings or your look will be too overwhelming. Like I said, these tips are clutter proof....if you follow them, you'll be sure to have the cutest arm candy. I cannot believe it's December! Time is sure flying by, and I am excited for Christmas and a new year. Today I wanted to share what I wore on thanksgiving. I know I'm late but better late than never right? For thanksgiving I wanted to dress comfy because I knew I was going to have seconds, thirds, and maybe even fourths (whoops). Loose clothing was a must for me, but I also didn't want to look like I was wearing my dad’s clothes (lol) so when shopping around, I was glad I found this chic oversized sweater dress. I’m a big sucker for ruffles and this dress was on sale for only $15, so obviously I had to get it. It also comes in the color “apricot” which is just as lovely as the grey. I’m wearing a medium and the length is perfect (I’m 5’4). For the most part, I was sitting down catching up with my cousins and family so wearing heels for the entire night wasn't a problem. I really like these OTK boots because they are comfy and don’t slide down. They also come in a taupe color. Happy start of the week everyone! 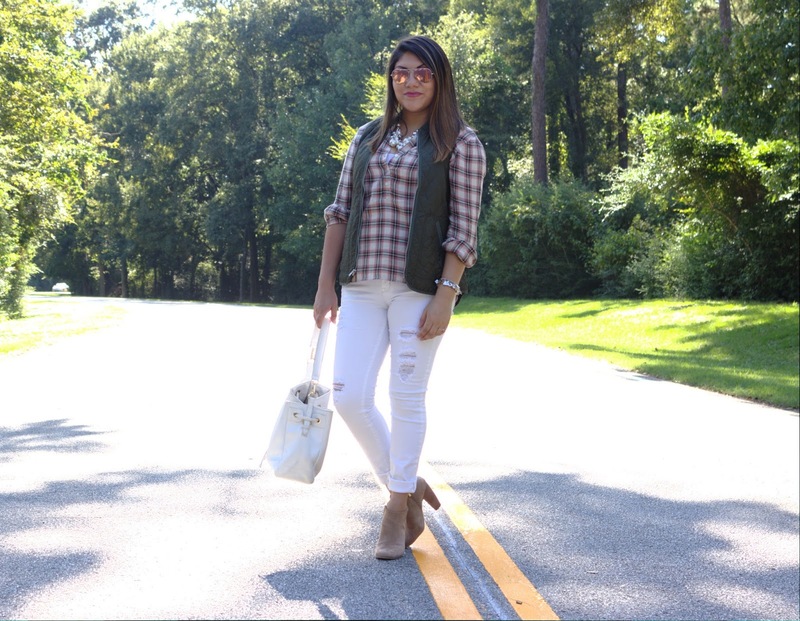 Today I'm sharing this quick, effortless outfit that I wore over the weekend. I love chambray tops because they look great with any type of bottom. I usually wear mine with white pants or floral pants/shorts but I wanted to get in the fall spirit so I paired it with black pants and fringe booties. I think the color of the booties and bag are what really gave my outfit that fall vibe. You guys these booties are awesome! They are definitely a must have in your closet. I'll definitely be wearing them all year round. This whole week and the next 6 weeks I will be pulling a daily 12 hour shift at work Monday through Friday followed by an 8 hour shift every saturday. You must be thinking that's cray cray and who the heck would work that much?? ?.....my answer would have been psshhh NOT ME! (lol) but when my boss said it would be counted as overtime I hurried up and signed up ha! I mean the holidays are coming up, and me and the boo are talking wedding plans so I am definitely taking advantage of that overtime to get extra cha-ching! It's the first day of fall! 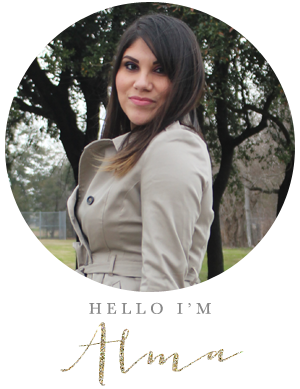 I'm so excited to bring out my scarves and boots however that will have to wait because Houston weather is still in the 90's. 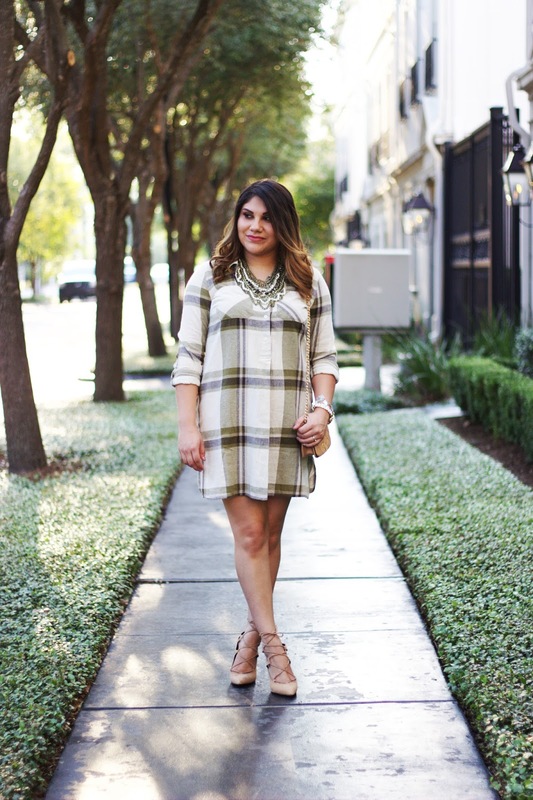 In the meantime, I'll be wearing some of my favorite fall to winter transitional pieces like this plaid dress that I am obsessed with! Pictures don't do justice to this dress, it's truly a must have! It is very comfy and the shoe combinations are endless. I plan to wear this dress in the winter with these OTK boots in the color "saddle suede" and in warmer days with ankle booties. Speaking about shoes, I had been eyeing these lace-up heels for the longest and finally pulled the trigger on them. In my opinion, they are definitely worth it. They are so flattering, comfortable, and only 4 inches-which is a plus for me! They also come in black or red in case you were wondering :) Stay tuned this week for my fall/winter favorites, and thank you for stopping by! The weather has been lovely here in Houston! This weekend we had slightly cool temperatures in the morning so i took advantage to shoot this fall look. 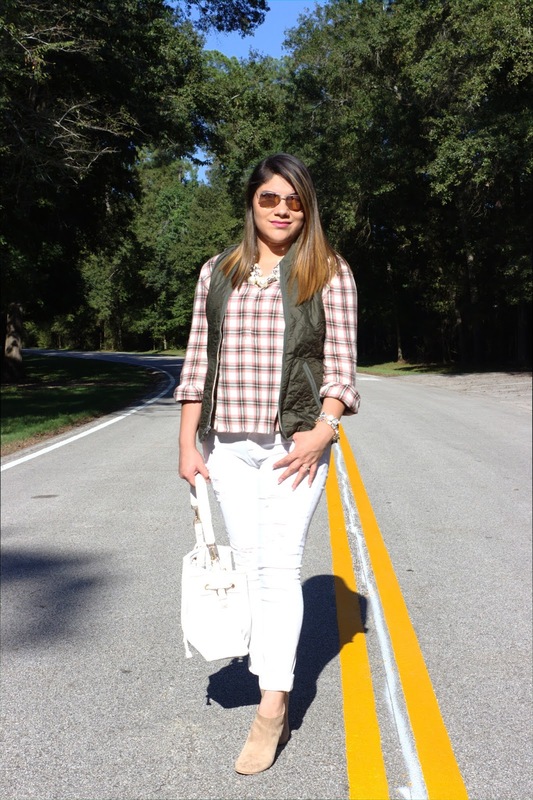 I love plaid and the color blush, so when I saw this top, I knew I had to purchase it. I love that it's high-low, and a popover top because ya know, sometimes you just dont have time to stop and button up 10 buttons. 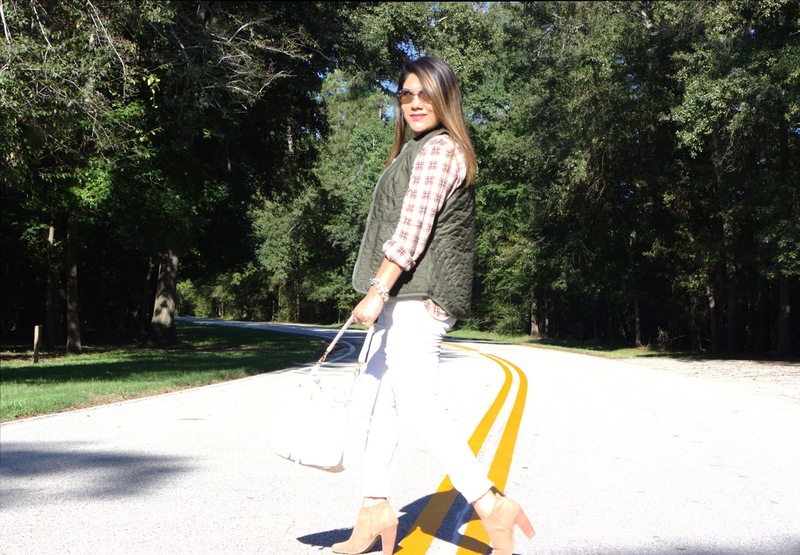 Another thing I love about this top is that the material is so light so it's perfect to wear in the summer as well with shorts and sandals!﻿ For this fall look, i added an olive vest because im obsessed with the olive and pink combo! 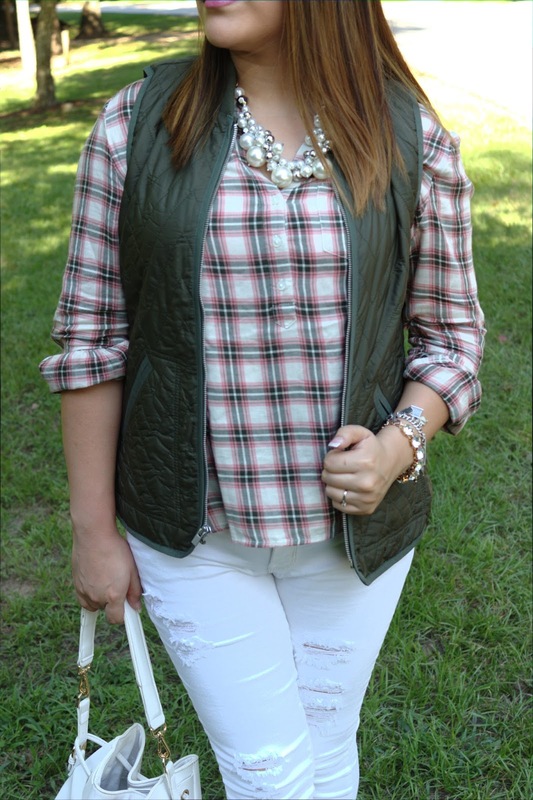 The top has olive in it so it goes perfect with this vest.